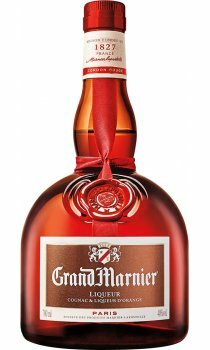 Grand Marnier's most favoured liqueur of their now extensive range, and is made uniquely and exclusively with a base of high quality Cognac, giving a rich and smooth taste to their famous orangle liqueur. A versatile liqueur used in many a cocktail, though ideally served chilled, over ice as delicious after dinner drink. Did you know? - Its makers, Marnier-Lapostolle, established their distillery at Neauphle-le-Chateau in the 1820's, but only began producing Grand Marnier in 1880. One of the world's most famous liqueurs and for good reason. Great orangey sweet flavour combined with the slightly warming cognac undertone. Does feature in a few mixed drinks and cocktails, but I can't see the point to be honest. Open bottle, pour into liqueur glass, definitely no ice, drink, enjoy, be happy! Grand Marnier has a very rich and warm taste. It must be the combination with cognac. It's not as fresh as Cointreau, but not as sharp either. It's soft, warm, and easy to drink. It's sweet, but not too sweet.